Many people take supplements to try to improve their health, body composition, and performance. In fact, over $36 billion worth of vitamins and related products were purchased in the U.S. alone in 2017. It can be really overwhelming to walk through GNC or to sift through all the options that are available to you online. Some reports estimate that there are more than 29,000 nutritional supplements on the market these days! That number will only go up in the future. In this article, we’ll cut through all the clutter and highlight four nutritional supplements that you should (probably) take every day. The word “probably” is in parentheses in that last sentence and in this article’s title for two reasons. First of all, whole foods are generally your best option. Supplements should only be used as an occasional convenience or to fill in gaps in your nutrition program. They cannot make up for a poor, imbalanced diet that is full of fried foods, doughy treats, and sugary sweets. Secondly, each person’s goals and nutritional requirements are unique. This article highlights four supplements that most people would benefit from taking every day. Ultimately, it’s up to you and your doctor (I’m not a doctor) to decide what is best for you. Did you know that your brain is nearly 60% fat? Adequate consumption of Omega-3 fatty acids is essential for optimizing the health and performance of your most valuable organ- both in the short-term and as you age. Insufficient Omega-3 consumption is linked to reduced cognitive performance, accelerated brain aging, weight gain, and chronic pain and inflammation throughout your body. There are three types of Omega-3 fatty acids: EPA, DHA, and ALA. EPA and DHA are the two that are most important to brain health, and they are found primarily in “oily” fish, such as pacific herring, wild salmon, and sardines. White fish like flounder or tilapia are not high in EPA and DHA. While the minimum recommended EPA and DHA intake is about 900 mg per day, most people fall well short of this. In addition, most people consume way too many Omega-6 fatty acids. Omega-6s are found in vegetable oils, low-quality animal products, fried foods, and processed foods. A high ratio of Omega-6 to Omega-3 causes a host of problems for your body and brain, some of which are highlighted above. 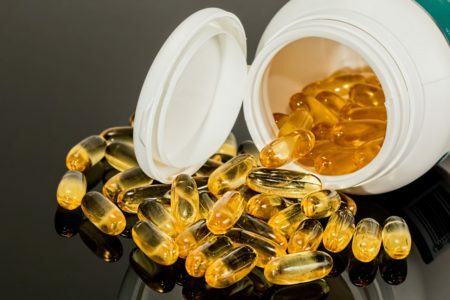 A quality Omega-3 supplement like fish oil (which is available in capsules or in liquid form) can help you consume more Omega-3s, while also improving your Omega-6 to Omega-3 ratio. You would probably benefit from consuming 1,500 mg of combined EPA and DHA each day. We all know that fruits and vegetables provide essential vitamins and minerals that help your body and brain function at their best. However, less than 15% of the U.S. population actually meets the minimum recommended daily intake of fruits and vegetables. A quality greens supplement and/or multi-vitamin can help make up for some of the nutrients that you are not getting from whole foods. Greens supplements typically contain fruits and vegetables and other nutrient-dense foods (i.e. wheat grass or spirulina) that have been turned into powdered form. You would probably benefit from consuming 1-2 servings of a greens supplement and/or multi-vitamin each day. Some reports estimate that up to 80% of Americans are deficient in Vitamin D. This is a problem because inadequate intake of this vitamin is associated with higher blood pressure, increased loss of muscle mass and strength as you age, and increased risk of cancers and neurological disorders. Vitamin D is extremely rare in foods, so it’s virtually impossible to meet your recommended daily intake from whole foods alone- even if you drink milk or other beverages fortified with Vitamin D.
Natural sunlight allows our bodies to create Vitamin D. However, it can be difficult to get enough Vitamin D from exposure to the sun- either because you can’t get outside for 15-30 minutes during each day or because you use a sunscreen with SPF of 15 or greater (which helps prevent skin cancer but also decreases almost all of the Vitamin D made in your body). You would probably benefit from consuming a supplement with 1000-2000 IU (international units) of Vitamin D each day. While the benefits of protein have been overstated by many people in recent years, protein is essential for preserving and building muscle. It also helps keep you fuller for longer since your body has to work harder to break it down. Most people fail to consume enough high-quality protein from lean, organic, high-quality meat, fish, poultry, and eggs, and/or from quality vegetarian sources like beans and lentils. Many people only consume protein from low-quality animal products, which are often fried and processed, thereby decreasing their nutritional value even further. A high-quality protein powder can go a long way toward improving your body composition and your overall performance. Beware of flavored protein powders though, as they typically contain added sugar or unhealthy preservatives that are intended to enhance taste and shelf life. You would probably benefit from consuming 1-2 servings of unflavored whey protein powder (or vegan protein powder) each day. No matter which supplements you choose to consume, be sure to read nutritional labels. Most supplements are not FDA-approved, and many contain questionable preservatives and additives. Be skeptical of products with ingredients that sound like they belong in a science lab, and be skeptical of products that are very low-priced. There’s a reason why that bottle of fish oil from CVS is $30 cheaper than the bottle of fish oil from Nordic Naturals. The supplement industry is largely unregulated, and there are many questionable products out there these days. Check with your doctor to decide what is best for you, and be skeptical of items that are very low-priced or that include mysterious ingredients. “Retail sales of vitamins & nutritional supplements in the United States from 2000 to 2017 (in billion U.S. dollars),” Statista, https://www.statista.com/statistics/235801/retail-sales-of-vitamins-and-nutritional-supplements-in-the-us/. “2017 Wellness Reports: Dietary Supplements,” Berkeley Wellness, http://alerts.berkeleywellness.com/catalogs/supplements.html. Berardi, John, “The 3 supplements I recommend,” Precision Nutrition, https://www.precisionnutrition.com/3-supplements-i-recommend. “Here’s How Americans Are Failing to Meet Dietary Guidelines,” Time Labs, January 14, 2016, http://labs.time.com/story/heres-how-americans-are-failing-to-meet-dietary-guidelines/. Andrews, Ryan, “All About Vitamin D,” Precision Nutrition, https://www.precisionnutrition.com/all-about-vitamin-d.